Congratulations to Michael Henderson on being selected as a Pacific Northwest National Laboratory Fellow. Mike is an internationally recognized and innovative leader in oxide surface science. His research provides a foundation for understanding the chemical and physical properties of complex oxide surface phenomena, such as catalysis, photocatalysis, oxide passivation and mineral weathering. Currently, Mike directs two DOE Basic Energy Science projects exploring the use of photocatalysis and photochemistry on titanium oxide surfaces to destroy organic contaminants, and the use of sunlight to promote the splitting of water. On these and other projects, Mike mentors students, coaching them in all aspects of fundamental research. His dedication and efforts earned him a 2005 DOE Outstanding Mentor Award. Mike is active in the scientific community. 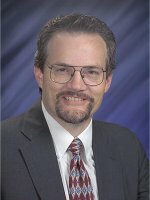 A Fellow in the American Vacuum Society, he is a board member and program chair for the Surface Science Division and has served in the society's regional chapter. In addition, he co-organized the 5th International Workshop on Oxide Surfaces, to be held in January 2007. He is also a member of the American Chemical Society. He regularly contributes articles to peer-reviewed journals, including the extensively cited 2002 Surface Science Reports review article on water - surface interactions titled "The Interaction of Water with Solid Surfaces: Fundamental Aspects Revisited."